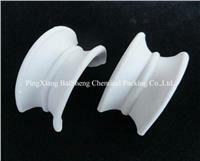 There are 3 kinds of intalox saddle: Ceramic intalox saddle, metallic intalox saddle, Plastic intalox saddle. Ceramic intalox saddle has advantage of large flux, low pressure drop, high efficience, it is widely used in the drying columns, absorbing columns, cooling towers, scrubbing towers and acetifier columns in chemical industry, metallurgy industry, coal gas industry, oxygen producing industry, etc. 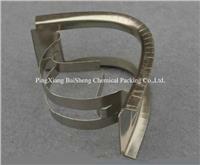 Metallic intalox saddle is an universal filling material, can be widely used in distillation, absorption and other reactions. It can be used in not only the vacuum tower, but also the high pressure tower. It is high performance random packing successfully used in mass transfer towers in different diameters. The plastic intalox saddle is made from heat resistant and chemical corrosion resistant plastics, including polyethylene (PE), polypropylene (PP), reinforced polypropylene (RPP), polyvinyl chloride (PVC), chloridized polyvinyl chloride (CPVC) and polyvinylidene fluoride (PVDF). It is used in dewaxed oil refined extraction, methane and benzene anhydride refining, etc.